The headstone marks the final resting place of a deceased person. It is generally placed on the area of a grave over the head of the buried casket. During the time of funeral planning or bereavement an engraving must be decided on. 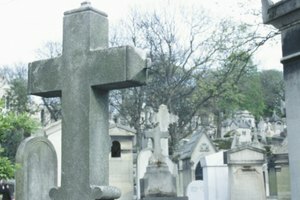 A person may determine what is to be put on her own headstone or the family may be left to pay tribute with their own choices. The last name of the person is generally the main identifier on the headstone. The first names and middle initials or names will be engraved under the last name on a two-person headstone. The dates of the birth and death are listed. For example, the headstone may read "John Thomas Dickinson/May 19, 1935–January 25, 1998." You may choose the years only, if the headstone is too small to fit many details. When you place an order for a headstone you will find that you have a variety of symbols to chose from. You may choose a plain headstone if it is more to your taste. 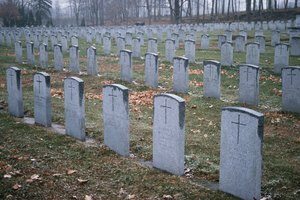 Symbols engraved on headstones may represent branches of the military, organizations, religious belief, special messages or areas of service to the community, among other things. 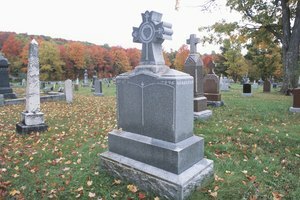 The more modern opportunities afforded to the makers of headstones enable you to have a photo of the deceased, artwork or scenery placed on the headstone. The engraving of a Bible represents a religious person or member of the clergy. A dove in flight is a symbol of eternal life for Christians and peace for a Jewish family. 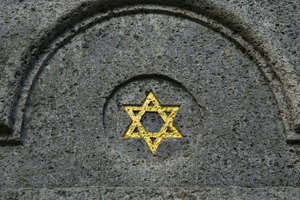 The star of David is the traditional sign representing Judaism and is often found on gravestones. Similarly, the crescent and star is often found on Muslim gravestones. Angels are depicted in several poses that have different meanings. An angel can be depicted flying the departed to Heaven, an engraving often found on a child's headstone, or blowing a trumpet to announce the Resurrection. A lamb is a sign of purity and innocence, particularly for Christians, and is often found on a young child's gravestone. The rose is symbolic of unfailing love, the bud representing a child under 12, a partial bloom a teen, a full blossom a person in her early to mid-twenties. An epitaph is a brief verse in memory of the deceased. It may consist of a Bible verse, poetry, words of comfort for the mourners or tribute to the departed, or an address of the departed soul. The epitaph can be written as a final message from the deceased himself in words such as "Father, into Thy hands I commend my spirit." You can honor a parent with words such as "Loving Mother" or "Devoted Father." Honor a fallen soldier or civil servant with "He sacrificed his life to protect and serve his country." Or choose a verse of poetry or scripture that had special meaning to the departed. Faloon, Suzie. "Things to Put on a Headstone." Synonym, https://classroom.synonym.com/things-to-put-on-a-headstone-12079912.html. 29 September 2017.